Get more from our best performing water filter with our 3-Stage Under Counter Drinking Water Filter System. This system features the superior water filtration of our 2-Stage System plus increased capacity to 2271L and an additional pre-filter to catch sediment and reduce clogging for high sediment areas. The AQ-5300 selectively filters more contaminants out, like lead, chlorine, chloramines and cysts, while preserving beneficial minerals like calcium, potassium and magnesium. Aquasana gives you exceptional value, with water costing as little as 2.6 cents a litre when you replace your filters every six months. Each time you replace the filters, you can give yourself credit for not using 4,000 475mL plastic bottles. The RCB3P produces up to 300 gallons of reverse osmosis water per day, making it a great choice for commercial applications. The system removes chlorine, hardness, heavy metals, toxins, and a long list of other water impurities. The system's built in booster pump takes the incoming water pressure and brings it up to the optimal level for the reverse osmosis process. This not only increases the system's production rate, but it also maximizes the efficiency in terms of drain to pure water ratio. The RCB3P's 20pouces oversized pre filters have the capacity to trap more contaminants, allowing the system to be used heavily without needing to change the filters as frequently. Restaurants, salons, labs, and offices all benefit in their own ways from high quality RO water, and the RCB3P gets the job done. The RCC7P is similar to the RCC7 in many aspects, but comes with a pre-installed booster pump to bring your incoming water pressure up to the optimal level for the reverse osmosis process. This allows the system to function at the highest possible level from production speed to drain ratio.With the system itself measuring 19 x 14.5 x 5.25 inches and the tank measuring 16 x 11 inches, the entire unit fits nicely in under-sink cabinets. The booster pump runs quiet, only generating a low volume hum that cannot be heard with normal kitchen activity.Also included with the system is a lead-free solid brass body faucet with a brushed nickel finish. The faucet is typically mounted on the counter as the main output source for the RO water, but output lines can also be connected to your refrigerator output, ice maker, and coffee maker.The RCC7P dominates in every performance based metric and will meet or exceed your expectations - guaranteed. 3-Stage Under Counter Water Filtration System with Faucet in Chrome Get more from our best performing water filter with our 3-Stage Under Counter Drinking Water Filter System. This system features the superior water filtration of our 2-Stage System plus increased capacity to 2271L and an additional pre-filter to catch sediment and reduce clogging for high sediment areas. The AQ-5300 selectively filters more contaminants out, like lead, chlorine, chloramines and cysts, while preserving beneficial minerals like calcium, potassium and magnesium. Aquasana gives you exceptional value, with water costing as little as 2.6 cents a litre when you replace your filters every six months. Each time you replace the filters, you can give yourself credit for not using 4,000 475mL plastic bottles. 3-Stage Under Counter Water Filtration System with Faucet in Chrome is rated 4.5 out of 5 by 1162. Rated 5 out of 5 by pax2 from Works great, good water flow, better than I expected. The... Works great, good water flow, better than I expected. The only problem I had was that the base on the faucet is very small and the rubber gasket almost went through the hole where it's mounted. I used a lager metal washer that I used under the sink (as a shim) to fix this problem. Rated 5 out of 5 by BellaMia from I purchased this knowing about my health issues with autoimmune disease. Living in lower Michigan... I purchased this knowing about my health issues with autoimmune disease. Living in lower Michigan we get our water from Toledo then MI South County Water. I use this Filtration System as a 2nd stage filter system being allergic to chlorine, fluoride and other water chemicals. 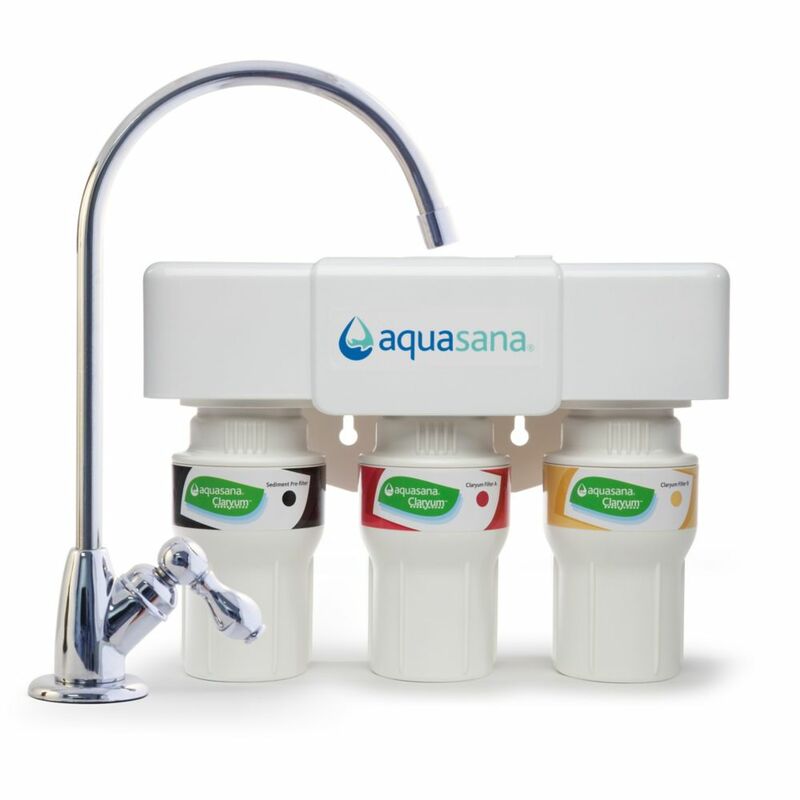 I have the Whirlpool full house filter 1st then in the kitchen the Aquasana is my 2nd stage and then into my Berkey Water Filter System as the 3rd and final removal of Fluoride and any other nasty things that’s in the water. I personally believe that everyone should at least have this in there kitchen for water to drink, cook and for our dear pets that also deserve to drink healthy. The unit is very easy to install and I believe well worth the peace of mind that comes with it. Thank You Aquasana! Rated 4 out of 5 by Steve from Delivery by Home Depot was sooner than I expected. AQUASANA installation instructions were easy t... Delivery by Home Depot was sooner than I expected. AQUASANA installation instructions were easy to follow along. The 3/8-inch brass tee fit perfectly with my existing water line; poly tubing was easy to install. I live in NYC co-op building that is about 40-years old so wanted to be on safe side especially with a baby/toddler. Definitely difference in taste of filtered water -- I accept that this is a good thing and my family got used to the taste of filtered water after couple of days. Little disappointed that AQUASANA inventory QA failed to see that my package was shipped with WHITE FAUCET RUBBER WASHER COVER when it should've been CHROME (see picture). This is reason for 4 out of 5 stars. Rated 5 out of 5 by Dutchman from Aquasana max flow system. The unit is easy to install. The faucet is well made and doesn't clutter up the sink area. The volume of water being filtered is adequate for our needs for cooking and drinking on demand. Rated 5 out of 5 by BigDickBlack from Very good product Water looks and taste good. Nice faucet. Filters will be easy to change. Rated 5 out of 5 by BillE from quality water on tap Aquasana is able to give quality product at value price. they offer the block carb. filter which really is need to stop chemicals. we are drinking a lot more water, since the system has been installed.